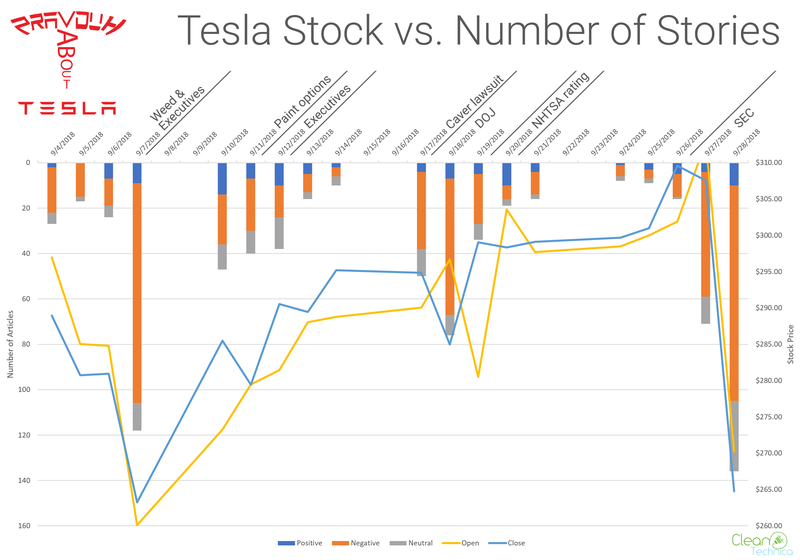 This is the first monthly publication of what the CleanTechnica team calls #Pravduh About #Tesla. For those who somehow missed it, about 4 months ago, Elon Musk got fed up with so much of the media publishing FUD (fear, uncertainty, and doubt) articles about Tesla, and in some cases outright misinformation, that he presented an idea. Most people who follow Tesla closely agree that it has been the target of far too much misleading, unfair, negative media coverage. We define journalism as: the pursuit of facts and reporting on them in a useful, proper context. When you systematically report with a slant that doesn’t line up with reality, or omit facts that are inconvenient to your point of view, that distorts the general truth of the story. We at CleanTechnica felt something did need to be done. As the stories — whether in the New York Times, New York Post, Forbes, Business Insider, CNBC, or Bloomberg — got worse, we were finally pushed to more systematic, regular action. Writers on our site had long been informing readers about the FUD and misinformation, and vice versa. We wrote articles digging into the facts and the finances, but that didn’t seem to be enough. Putting our own playful spin on the name Elon mentioned on Twitter, we took #Pravduh About #Tesla into our own hands. The more these #Pravda About #Tesla reports get shared online through social media, the more people will take notice. If there is an ongoing heavily negative slant about Tesla in certain outlets — even as Tesla has so much positive news to share — people should be aware of this and approach each new story with that in mind. If you want to know more about our methodology, there is a comprehensive explanation at the bottom of the report. First, though, we will present in this article the monthly report and then the weekly report. One thing we would like to note is that in previous weeks we didn’t realize that the Fox News website didn’t include articles from Fox News Business. This has now been rectified and all of the raw data documents from the previous weeks have been updated. 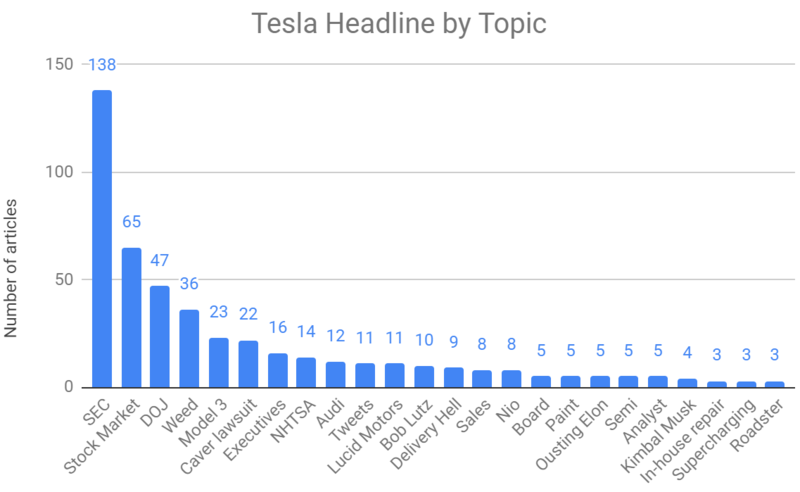 To clarify one point about methodology, though, in our effort, we track Tesla headlines and rate them based on their implications for Tesla. Our report covers 22 major media sites. We rate all of their Tesla headlines as either positive, negative, or neutral. If a headline is factual but implies something negative, it is labeled as such. The purpose of this project is not to systematically judge whether headlines are misleading. We deal with some of those articles separately. However, we think it tells us something if there are 30 headlines about one negative story and only 2 headlines about a strongly positive story. This month, the ratio of negative to positive articles was almost 5 to 1. There were 362% more negative articles than positive articles. Even if you combine neutral and positive headlines, there were still more than twice as many negative headlines. 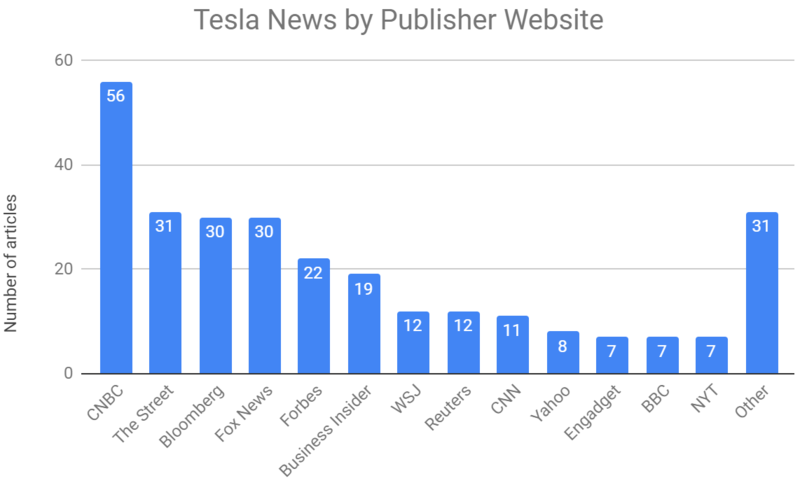 The sites publishing the most about Tesla were: CNBC, Bloomberg, Fox News, and Business Insider. Aside from the websites featured above publishing the most Tesla-related stories, “Other” this month includes: TechCrunch, USA Today, The Verge, New York Times, BBC, The Guardian, Wired, Gizmodo, Vox, BGR and MSNBC. The following might be our most important analysis of all. There are a lot of data embedded (and you probably want to click the image to see it larger), but basically what we did was compare the effect the number of negative articles had on the stock. Now, the question remains whether it was the actual events that lowered the stock price or the number of articles published about them that day. In other words, how much were shareholders influenced by the sheer volume and messaging of negative headlines? Now, we at CleanTechnica have been wondering why one, two, or a maximum of 3 articles on the exact same topic on the exact same day isn’t enough. This doesn’t even consider all 138 articles regarding the SEC from throughout the month of September — only the 95 on the 27th and the 28th of the month. As you will find out in the weekly report below, especially this week, there is a lot of positive news regarding Tesla and its products that went unreported. 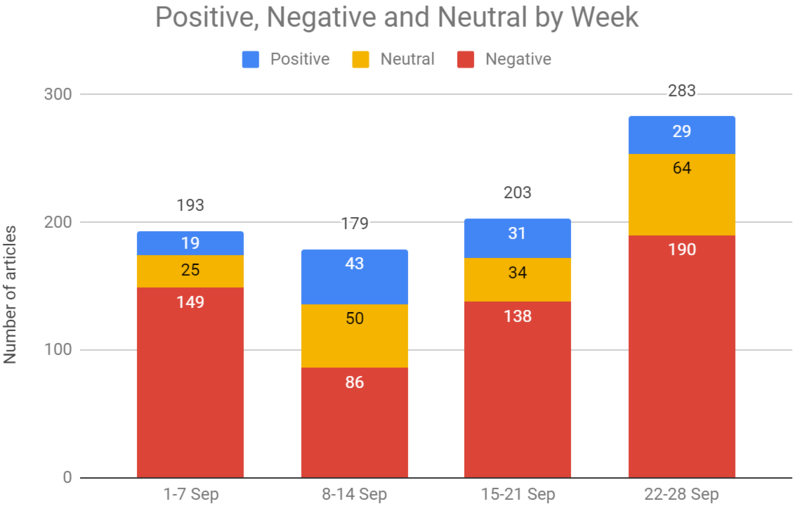 Whether a 50% negativity index is appropriate, as a reminder, depends on whether the overall Tesla company story really had a 50% negative week or month. All of the above is useful when compared to how Tesla objectively evolved or devolved. This table and the chart above it are based on only one month of data collection and headlines. It will be interesting to see what these look like in a few months. The SEC investigation appears to be over, production and sales appear to be up very strongly but we are awaiting official numbers and major media outlets have decided to not publish on supposed leaks or speculation. Will all of that matter to these media outlets or will they continue their negativity in the face of so much positivity from Tesla buyers and reviewers? We’ll see. For now, you can consider for yourself what were objectively the important updates in the “Tesla story” in September. Were they primarily negative as these media outlets imply, or were they primarily positive due to Tesla’s production ramp, NHTSA safety scores, many positive reviews, and product updates? CleanTechnica is also now working with a web development company to create a comprehensive automatic Tesla analytical platform. In time, we hope not only to be able to score headlines but also the content of articles themselves by scanning them for FUD (Fear, Uncertainty and Doubt) as well as misinformation. Our hope is that, once ready, people rating the articles will help to continuously improve the algorithm as well as give a second opinion! Here is the data from this month if you want to have a closer look at the raw data. This week, the ratio of negative to positive articles was almost 13 to 2. There were 555% more negative articles than positive articles. There were almost twice as many neutral articles as positive articles, but neutral ones were still approximately 33% of the negative ones. Even if you combine neutral and positive headlines, there were almost exactly twice as many negative headlines. The sites publishing the most about Tesla were CNBC, The Street, Bloomberg, and Fox News. Aside from the websites featured above that published the most Tesla-related stories, “Other” included: USA Today, Wired, Gizmodo, Vox, Gizmodo, The Verge, TechCrunch, BGR and MSNBC. More information regarding news from these dates is included in the section “What Changed with Tesla Last Week” further down the article.